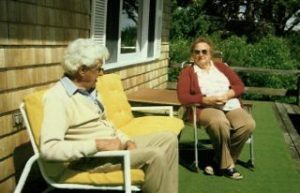 Joe and Althea wait on their deck for guests to arrive. 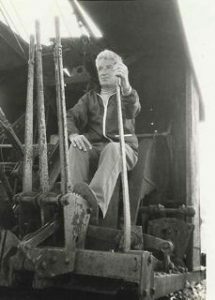 Hall Quarry Rentals: The Command Post, Seaweed and Deer Track were established by Joe Musetti and his wife Althea. 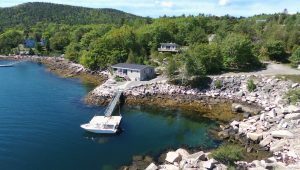 After the years of working in the quarries, Joe, with the help of Althea, started building and renting cottages to vacationers visiting Mount Desert Island. From the Command Post, where they lived, they would sit and wait to greet their tenants. Over the years, they made several good friends that they considered family. Several of their vacationers continue to visit the area and have been returning to stay at the same cabin for more than 40 years. Old memories of years staying with Grampie and Grammie have turned into new memories with our family. Boating on and around Somes Sound allows us to get to know our guest and to continue to grow our friendships. 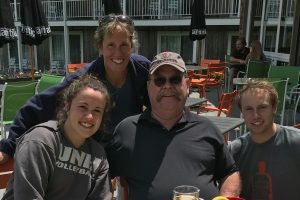 It is only fitting that I, the youngest grandchild of Joe and Althea, and her husband, son, and daughter, decided to keep the family tradition going, and continue to provide vacationers with a place to stay while visiting Mount Desert Island. Not only do Colin and Riley help get the cottages ready in the spring and assist in the cleaning and ground maintenance, they have both chosen a college career in Hospitality. Colin has graduated from the University of New Hampshire, and Riley is a junior at Husson University. Joe working in the quarries on the crane. The location of the Command Post location was very deliberate; nestled in the middle of the granite quarries once worked daily by Joe and his sons. Today the Command Post, Seaweed and Deer Track and their many guests hold sway over the heart of Hall Quarry, maintaining a constant, vigilant watch over Somes Sound and a landscape where the mountains truly meet the sea.